I've got a friend at work who we'll call "Bill" who rebuilds tube stereo gear as a hobby. He's been working his way up to his dream stereo by buying trashed high-end, tube stereo amps, restoring them, selling them on eBay, and using the money to move up. On coffee breaks, Bill and I trade tube talk and amp talk for fun. For years, Bill had another friend who used to tell him about his collection of vintage tubes. Bill's friend died a year ago. Knowing of their friendship, the family invited Bill over and asked if he wanted to pick through the tubes before they disposed of them. Bill went through the stash and got a real shock: It turns out that Bill's friend was an inveterate, long-time tube collector and hoarder and had amassed HUNDREDS of vintage and New-Old-Stock tubes of all descriptions. Hundreds. Bill told the family they had a real cash cow on their hands if they managed it right. The problem was that the family knew nothing about tubes and didn't know enough to know where to start. So, Bill volunteered to do what he could for them and started sorting and cataloging the stash. That how I came into the picture. In order to sell the tubes on eBay and get the best value for the family, Bill needs to have the most valuable tubes tested and certified with their electronic values. On the other hand, Bill's wife is tired of the little dribs and drabs of money his hobby has been costing and isn't feeling particularly charitable towards this venture so it must be self-funded. So, Bill asked me to "be a part of it all." How? The other day he brought in a large plastic bag of some of the tube types I use and said, "Pick through them, try them out, and see if there's anything you want. I'll give you great prices." In turn, he would take this first injection of money from my purchases and send out a batch of tubes for testing and certification. So, I took this volleyball-sized bag of tubes home and began evaluating them by "tube rolling." Tube rolling is the practice of substituting tubes one after another into the same place in a tube circuit and listening to the result. The bag was full of two types of tubes: 6V6 power tubes and 5Y3 rectifiers. I currently have four amps that use those tubes: a Fender Deluxe Reverb Reissue, a hand-built reproduction tweed '59 Fender 5E3 Deluxe amp, a '64 Gretsch 6150T Compact Tremolo amp, and a '71 Fender Champ. On the 5y3 side we've got RCA, Sylvania, Zenith, National Union, Thoro-Test, and Ken-Rad tube examples. As I've related in another article about tubes HERE, a few months ago I tracked down an RCA 5Y3 rectifier for my Tweed Deluxe from eBay and was extremely pleased with the results it provided: greater compression and sustain than the modern 5Y3 examples offered. With this new batch I decided to pick up some spares of the same basic design. I chose a new-old-stock, new-in-box GE 5Y3GT, a used GE 5Y3GT that sounded good, and a couple of interesting related designs: a Sylvania JAN CHS 5y3GT and an RCA USN-5y3WGTB brown-base tube, both military-spec, physically beefed-up 5Y3 tubes. Okay, I'll admit a certain affinity to the military-spec tubes simply because they were designed for the military. I did find one totally dead 5Y3, ironically labeled "Thoro-Test." On the 6V6 side, Bill had both the small-envelope versions and big-bottle tubes as well from GE, Sylvania, National Union, Tung Sol, Silvertone, and Ken-Rad. I looked for similar designs, dates, and markings to make up power amp pairs from single manufacturers. By those criteria I chose four RCA 6V6GTs in two pairs. The "GT" designates the compact-envelope tube. The first RCA pair I chose were sweet, high-headroom tubes that do the clean portion of the Tweed Deluxe sound very nicely. The second pair offers a bit of hair and a nice, round, smooth distortion that eases in fairly early on the dial. Each pair is useful for the sounds it offers and I can switch them out at will for studio work. I'm afraid the lovely, big-bottle National Union 6V6s were too big to fit between the chassis and speaker of the '59 Deluxe but I did love their looks. So all told, I choose four 6V6GTs and four 5Y3s. With the tubes in hand, I worked to create a fair offer to Bill. I went out onto eBay and found identical examples in similar condition that were offered as Buy It Now sales. I set those prices as my guide and wrote-up my offer with explanations. Bill was delighted to accept it. Voile'! So now, Bill had seed money to test the tubes and the family got better financial returns from their collection of tubes, and I got a little trove of really cool vintage tubes to power my amps. Everyone is happy! But here are the real take-aways: different tubes and different combinations can really make a difference in how tube amps sound. 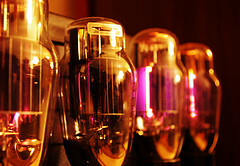 Modern tubes can tend towards a harder, more forward sound. Older tubes can vary, offering a rounder sound or a lower distortion threshold. A hint: when tube rolling, working with a cathode bias amp such as the Tweed Deluxe allows you to trade tubes to your heart's content without needing to re-bias and without fear of damage from bias mismatch.